Hello everyone, welcome. 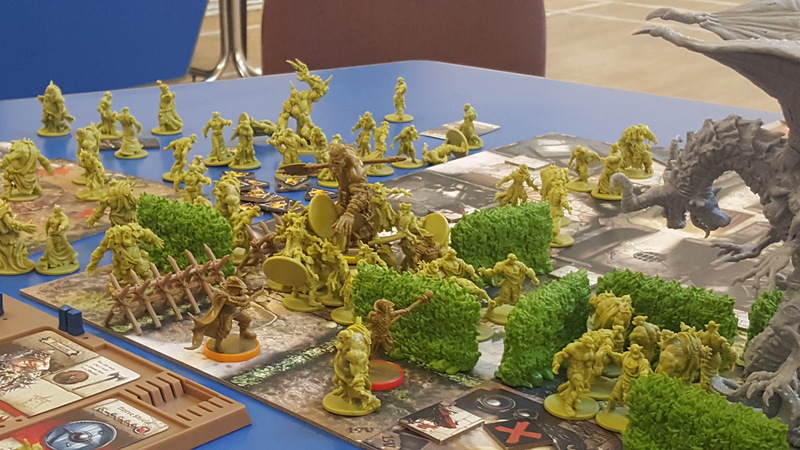 I recently had the opportunity to play Zombicide: Green Horde, as my friend, Stuart, had backed near enough all of it. He has had the core Green Horde box for a while, but the Stretch Goals have just arrived with new monsters and new survivors, so he was itching to play. He has played Green Horde before without the stretch goals but I was absent from that game. In the end up there were only 3 players for our game and as we had chosen a hard game, we each took 3 characters. I chose Asmodeus (Not V from V for Vendetta) and Anton Guffin (Not Iron Man). We also had Countess Odelia (Not Princess Leia), Zanzibar (not Freddie Mercury), Sir Schwarz (not the Black Knight from Monty Python) and A giant called Finarton (Unclear if that is the spelling). I really tried to make a Transformers joke when I saw that Anton Guffin’s starter ability was Ironhide, but it went down like a Red non amphibious van in a lake. By which I mean it was worse than that attempt at a joke. Our Objective was simple. We had to move some barricades to funnel the zombies in one direction, assault a structure that was housing a trebuchet and then flatten the horde. The structure required a key to gain access and there were 4 objective tokens where it could be hiding. Picking up an objective was worth 5xp and a vault item of your choice so that was cool. We got started. Our first turn was pretty uneventful. We proceeded with caution towards the closest objective, and didn’t get that many zombie spawns. Asmodeus was volunteered to go in and grab the first objective, and as fortune would have it, it was the Key. I then searched the Vault and chose the War Cleaver. This was a two damage weapon that hits on 4+ and has 4 dice. Add to that I had an offhand curved blade which added to my attack roll and suddenly on turn two I was like a D&D 5e Ranger, Hunter Archetype with Horde Killer. Zanzibar grabbed the second objective in the adjacent room and picked up the Lava Burst Spell. By the end of turn two we were a force to be reckoned with. This proved to be fortunate. Someone (Jonathan/Zanzibar) managed to get us into yellow/level 2. I had avoided doing that with Asmodeus when presented the opportunity as I wanted the other characters to get the xp to catch up. Unfortunately, sometimes the person with the most xp is also the best option when you are in a bind and a necessary lava blast on a square of runners later put Zanzibar into the yellow and caused a Necromantic Dragon to spawn. It could only be wounded by ballistae (not available) or magic. Zanzibar was the only option. But it was only 1 xp and the damage was done. The Dragon landed on an empty square 2 spaces from us and was turned into a fireball before it could move. We advanced with Countess Ordelia constantly buffing Zanzibar which allowed us to blast a path through. Finarton proved to be very useful as he had a giant ability which allowed him to pick up and throw zombies. Add to that Asmodeus cutting a bloody path, we made good progress. Now, as with any game where players take more than one role, you can’t help but focus on one of your characters. So Finarton, Asmodeus and Zanzibar leveled up, whilst the other three lagged behind. Perhaps my favourite part of the game was when a horde of zombies was being funneled towards the main party. They couldn’t see the ambush set by Asmodeus and Anton Guffin. With a woosh, a buckling of swashes, and possibly a lengthy monologue about symbols/freedom/blame/blowing up parliament, Asmodeus leaped into the fray. This is probably my favourite photograph of any game ever. I just love the story you are seeing here. Incidentally, I have specifically linked Asmodeus to V from V for Vendetta, but from this angle he could almost be Solomon Kane (which would be equally awesome). However, he has a Guy Fawkes mask (sort of) so it is V.
So, is anyone seeing the flaw in my plan? That would be the abomination in the adjacent square. Here’s the thing. I had three actions, took one to ambush the zombies and then did a slice and dice expecting to kill all three zombies before retreating, like a ninja. Fortunately, Asmodeus did not fight alone! Zanzibar rushed to my aid and blasted the abomination to smithereens with magma and lava! Meanwhile, behind us Finarton was having fun throwing zombies around and smashing with his reach. As a group, we worked well together and managed to get the barricades built which meant all the zombies came from one direction, which lead to a heroic fiery death for Zanzibar and Ordelia (which bought us about a turn) as they tried to swarm. We considered trying to thin the herd down a bit but realised we’d just get overrun like Zanzibar did so did what any self respecting hero would do, we ran for the objective. It was pretty hairy as we ended up using all of the runners and walkers causing numerous multiple activations, meaning they started to catch up with us. However we had a big head start, cleared out the structure housing the trebuchet quite quickly and hacked apart the defenders even quicker. We took 2 fatalities, but won the encounter. Zanzibar and Ordelia will both be mourned. We shall commemorate them with a single trebuchet salute onto the nearby horde. She did her job early on, ended facing off against an early appearing abomination. She was victorious in that encounter but when the horde appeared and she needed to thin the ranks quite considerably, she was betrayed by her dice and ultimately overrun and we lost that particular game. Not as a result of that action, that was simply one example of the dice letting us down badly. I think, next time we play I am going to suggest that equipment gets traded round a bit more so we get leveled up more evenly. Aside from the fact it is no good when half the team are still level 1, it isn’t much fun for the level ones if everyone else is getting the cool equipment and thus all of the xp – you never get a chance. Trade the weapons and spells around, then once everyone is up, give them to the folk that make the most sense. That is a thought for the future. Great game, great fun. See you next time! I think the new mechanics that make this slightly different from Black Plague do make a difference. The barriers and hedges make some interesting changes to the game and the horde mechanic is worrying and as we found out in game two highly devastating if it appears in the wrong place. Can’t wait to play the no rest for the wicked and friends and does expansions. Also need to play a stranger things themed game as well.